We're nearly to the second season of Android: Netrunner Organized Play for 2018, and that means we'll soon be able to plan more runs, delve into more servers, and access more prizes! After all, as Runners, we aren't just breaking walls and braving lethal sentries to prove a point. That may be a part of why we run, but we also want to see what's in those servers! We can't even call it a successful run until the data's been ripped. To that end, we're bound to make use of all the new toys from the Kitara Cycle—especially since the last pack has just released. And we'll be looking forward to the release of Reign and Reverie, as well as the chance to meet—or evade—the various kingpins of ChiLo. All the new cards from this deluxe expansion and the Kitara Cycle Data Packs are certain to shape our future runs. In the end, though, the reasons for running and the rewards for running are two different things. And the 2018 Season Two Kit for Android: Netrunner Organized Play has enough prizes to reward up to sixteen runners at each Critical Run event, plus Elite Prize Cards and Elite Prize Items for the Top 4! Feel a little like making sure the corp knows you've been mucking about in their servers? Or if not you, specifically, do you want to make sure the corp knows that someone has been shredding their ice? It's a common impulse and one well-served by the alternate art copy of Imp made available to the Top 16 participants in each Critical Run event. 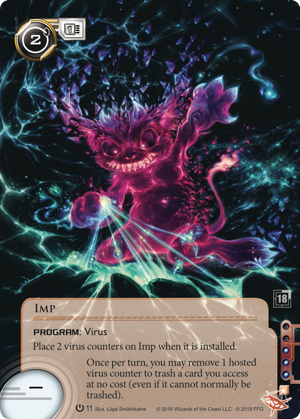 The artwork by Liiga Smilshkalne personifies this destructive virus as a playful, fanged little demon happily tearing apart the corp's data. There are seventeen copies of this card in the 2018 Season Two Kit. Sixteen are for players. The seventeenth is for the event organizer to keep or distribute at his or her discretion. Speaking of acts of destruction—very little is known about the online predator known as Apex, only that it seems to destroy and consume all it touches… So could Apex be an artist? 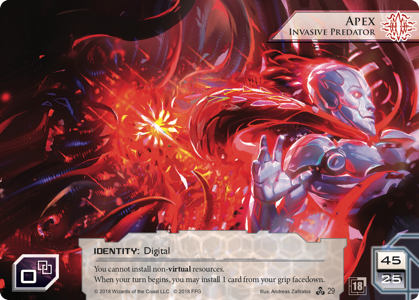 It doesn't seem a likely theory, but if the predatory behavior is really just a precursor to some visionary reworking of the Network, it would make sense to begin with the alternate art version of Apex envisioned by Andreas Zafiratos. Shown ensnaring—and likely devouring—an unfortunate bioroid's avatar, this Apex is bold, bright, and unpredictable. It's also a prize option made available to the Top 4 players at each 2018 Season Two Critical Run event. 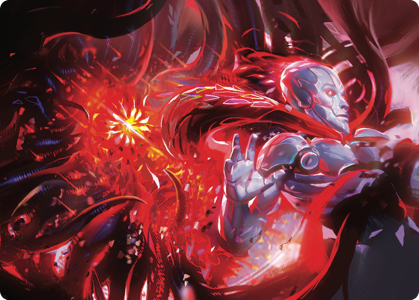 In the order of their placement—from first through fourth—the Top 4 players each choose one Elite Prize Card or Elite Prize Item, and if you can make the Top 4, this stunning alt-art Apex offers you a new way to envision the inscrutable runner's hidden purpose. The 2018 Season Two Kit includes three copies of this alternate art version of Apex. Two are for players. The third is for the event organizer. You could argue that the very best traps aren't triggered until your prey feels smugly secure in its victory—and then you rip that victory away. Unequivocally. What's more, if that's how you like to play Haas-Bioroid, with ambushes that gobble away unspent clicks, trash the runner's rig, and swing the momentum back toward your ultra-efficient bioroid strategies, then you'll be thrilled by the Elite Prize Item in the 2018 Season Two Kit—an acrylic Haas-Bioroid click tracker. 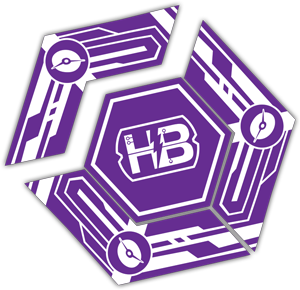 If you look at the alternate art on the Apex card and see a sucker taking the bait on one of Haas-Bioroid's best-laid traps, then you'll want to make the Top 4 at a Critical Run event in order to get your hands on this Elite Prize Item. In fact, you'll probably want to make the Top 2 because there are two of these in the 2018 Season Two Kit, and you never want to aim for corporate data on your last click—or even on your third click when you're assaulting one of Haas-Bioroid's servers! 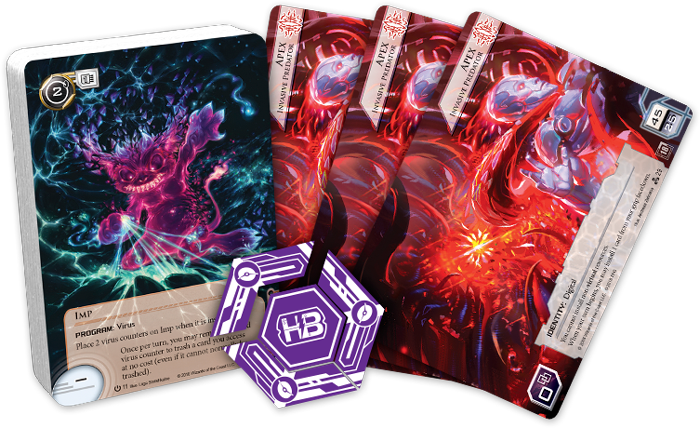 Want to take your shot at the cool new prizes in the Android: Netrunner 2018 Season Two Kit? Then start planning your run today. Talk to your favorite local game store to find out when they'll be hosting their 2018 Season Two Organized Play!